Tourists have long flocked to Morocco’s Red City for a taste of the exotic. The very name conjures up spices, snake-charmers, and sensual delights. Its food steeped is in Berber and Arabic influences and eating here can be a great adventure. Marrakech has got to one of the most evocative, mouthwatering and unique destinations for foodies in the Mediterranean region. But Marrakech can be bewildering for the first time visitor (or any visitor). Save yourself from mediocre couscous with this guide to finding the best food in Marrakech. Marrakech historically was one of the main trading posts and markets in North Africa. Goods and spices were carried up the Saharan trade routes by camel. The Arab influence brought mezze and fruits from the east. French rule left its mark too, as did occupation of Andalucia. Marrakech has desert, mountains, and sea within close range. Stews are scented with honey and saffron, cumin, preserved lemon, olives, and dates. Stalls in the medina are piled high with spices and mint and figs. Morocco doesn’t have a culture of eating out so the majority of restaurants are targeted at visitors rather than locals; it’s all too easy to come away having eaten average tagines at inflated prices. 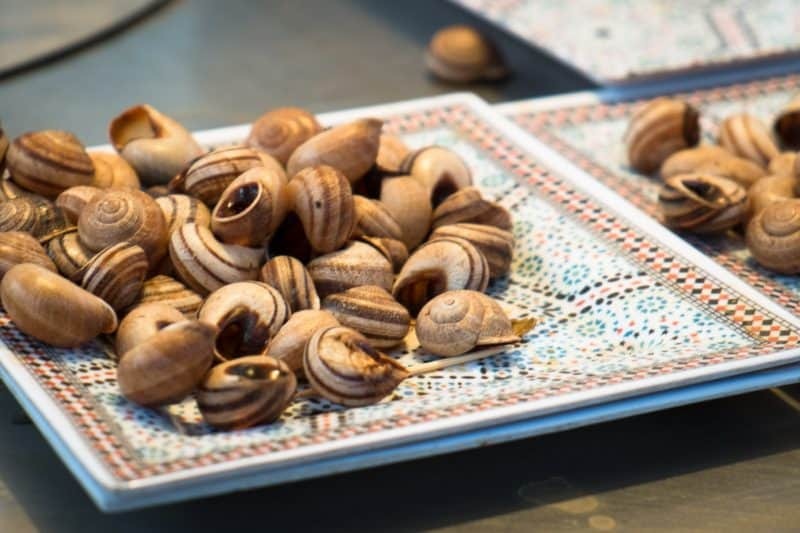 The best traditional Moroccan food is usually found in the home, so if you’re staying in a riad do make the most of any opportunities to eat or cook with your host. Locals generally prefer to eat international food when out for the evening. The main dishes associated with Morocco are tagine and couscous. You’ll never see these served together, they are separate dishes—and couscous from a package is sacrilege! Couscous is traditionally eaten on a Friday (the holy day) and is the Moroccan equivalent of Sunday lunch. It’s painstakingly hand rolled from semolina and steamed with the meat and vegetables. 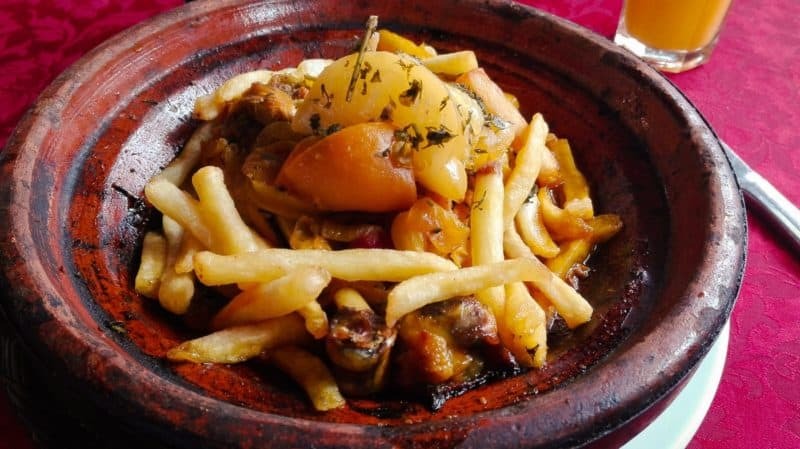 In Marrakech, you’ll also find tangia, a stew cooked in a clay pot in the embers underneath the hammam (as opposed to on a stove top in an earthenware tagine). Atay Cafe. Near the Ben Youssef Madrasa, this is the one with the most Instagrammable roof terrace. Vibrant juices and boho-chic vibes. Cafes des Epices. 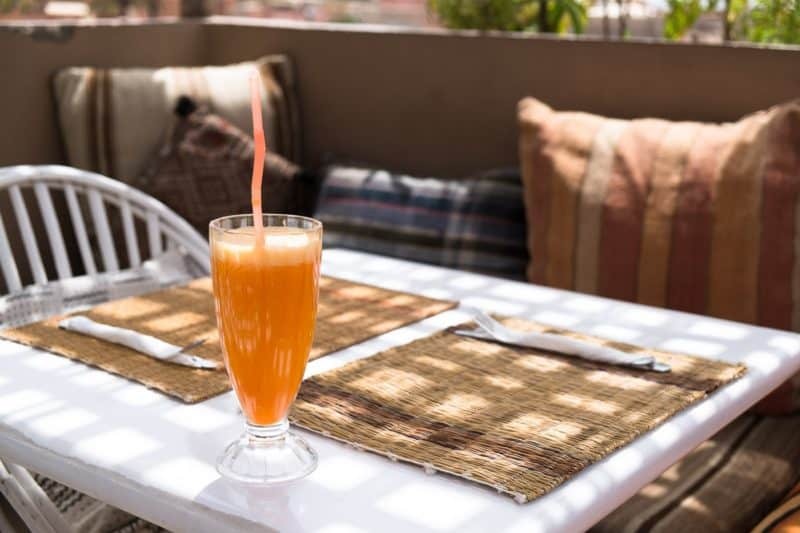 One of Marrakech’s hippest cafes, head to this multi-level Spice Market cafe if you’re craving a latte or looking for a light lunch, chill beats and rooftop views. Cafe Clock. Originally started in Fes, Cafe Clock now has an outpost in Marrakech. It famously serves a camel burger and offers cultural workshops and regular jam sessions. Cafe du Livre. One for the bookworms (and those tolerant of cigarette smoke), this friendly hideaway and English-language bookstore has an alcohol licence and is popular with expats. Grande Cafe de la Poste. For ambience, this restored colonial-era brasserie is hard to beat for drinks or dining. It’s a decadent local institution with local ingredients and live jazz in the evenings. Dar Moha. Moroccan nouvelle cuisine in a renovated riad. Kechmara. Contemporary menu with a range of burgers, this is also one of the coolest places to grab a beer in town. Ksar Essaoussane. Good value tradition Moroccan dishes in a beautiful candlelit riad with excellent service. They’ll even send a cloaked man to come meet you if you’re having trouble finding it. Latitude31. Modern Moroccan fusion in a laid back courtyard setting. La Maison Arabe. The established spot to go for elegant fine dining, tinkled ivories, and the swankiest bar in town. Le Foundouk. Stylish dining in this old caravanserai, book ahead for candlelit tables on the roof terrace with Medina views. Le Jardin. Greenery and garden cool in this chic secret hideaway in the medina. Un-intimidating Mediterranean and Moroccan dishes with a side order of designer kaftans. Libzar. Modern Moroccan menu in Gueliz. Mes’lalla. Contemporary Moroccan fusion at the Mandarin Oriental hotel. Nomad. 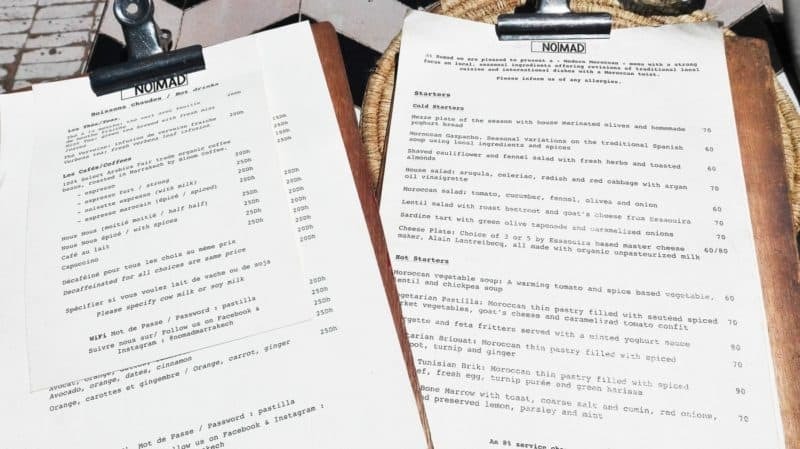 Marrakech’s most beloved hipster restaurant, with echoes of Ottolenghi, excellent ice-cream, and a ground floor store selling fancy kitchenware. Pepe Nero. Moroccan and Italian menus in this romantic riad restaurant. Riad Kiass. 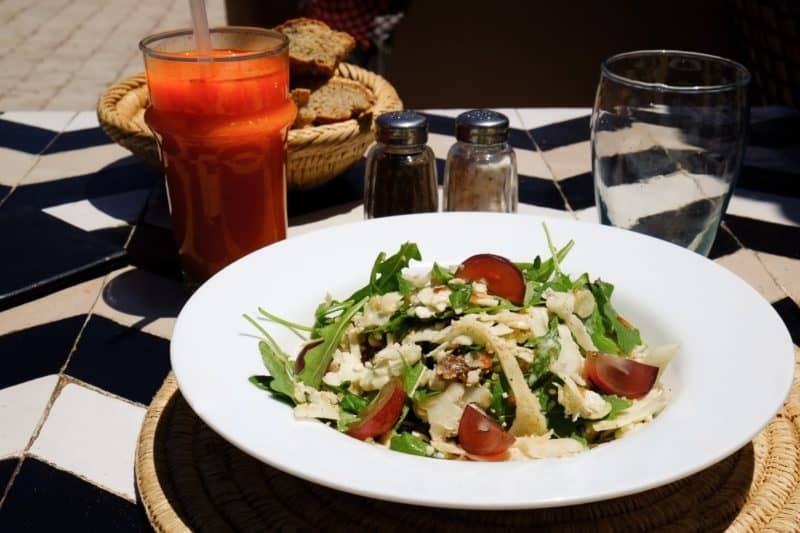 If you’re looking want to sample riad dining, the cooking at Riad Kiass is well regarded and has a strong emphasis on the organic. Salt. Female kitchen team and tasting menus at this riad restaurant within the Dar Les Cigognes luxury boutique hotel. Amlou. A delicious mixture of argan oil, honey and almond paste. This is your new favourite dip. Barbouche. Snails served in a lightly spiced earthy broth, these snails taste more like mushrooms than you might expect. Crazy Bread. One of the many names for fluffy pitta-esque sandwiches stuffed hard boiled eggs, mashed potato, and spicy sauce. Also look out for sandwiches featuring aubergine (eggplant) or sardine. Besarra. Garlicky fava bean soup. B’stilla. 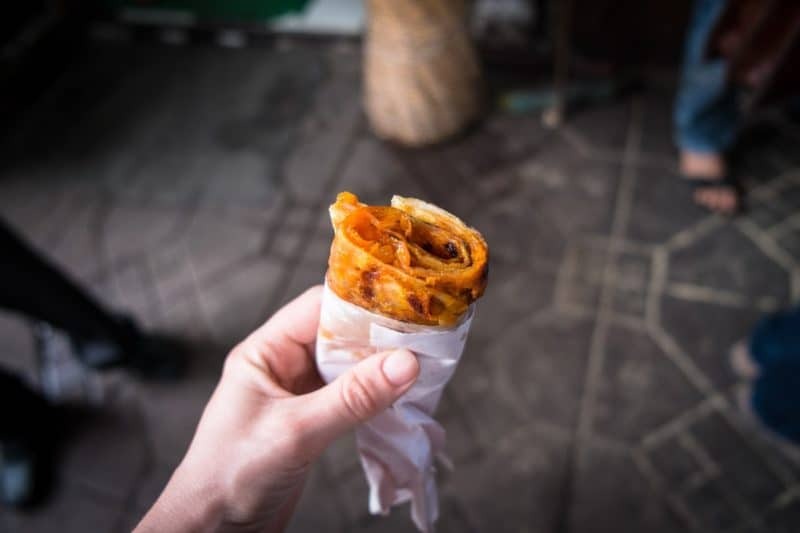 The classic Moroccan dish is traditionally made with pigeon or chicken meat encased in thin flaky pastry and sweet spices, but other fillings such as seafood are available too. Briouats. Little triangular samosa-like filled pastries, stuffed with meat or sweet almond paste. Brochettes. Grilled skewers of meat, one of the most popular street foods on Djemma el Fna. Harira. 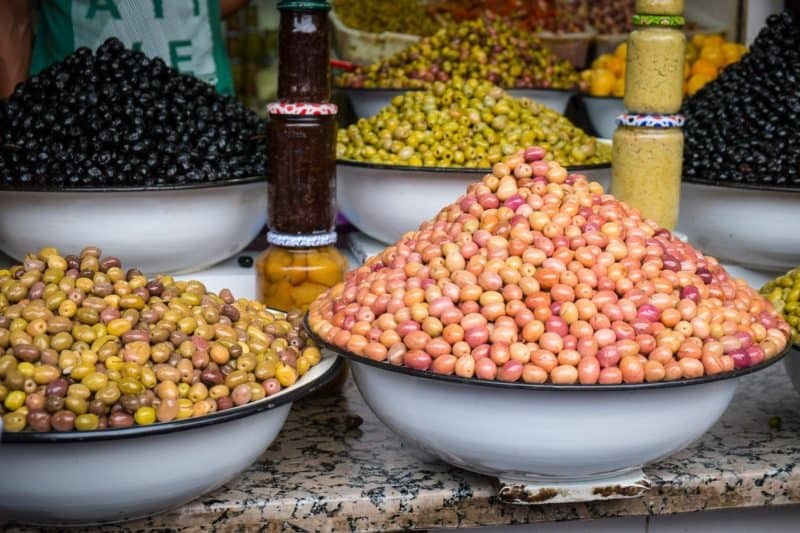 Traditionally eaten during Ramadan to break the fast, little bowls of this hearty lentil and chickpea soup are some of the cheapest street foods you can find in Marrakech. Hodangal. There’s a cluster of stalls in the Djemma el Fna serving sweet spicy teas with digestive properties. Juices and smoothies. These are everywhere; try combinations of banana, date, avocado, almond, orange, and sugar cane juice, orange blossom water, honey, figs, and rose water. Khobz. The staple Moroccan bread; round, flat, often made with semolina flour and great for dipping and scooping. Loubia. Moroccan baked beans! Traditionally a morning dish. Dip your khobz. Ma’qooda. Potato fritters dipped in egg and deep-fried. Mechoui. Spit-roasted lamb, with the offal also available for the more adventurous. Mint tea. It’s almost impossible to leave Morocco without having tried ‘Berber Whisky’. Mint leaves brewed with green tea, poured from a height to induce bubbles and usually served with a stack of sugar cubes. M’smen. 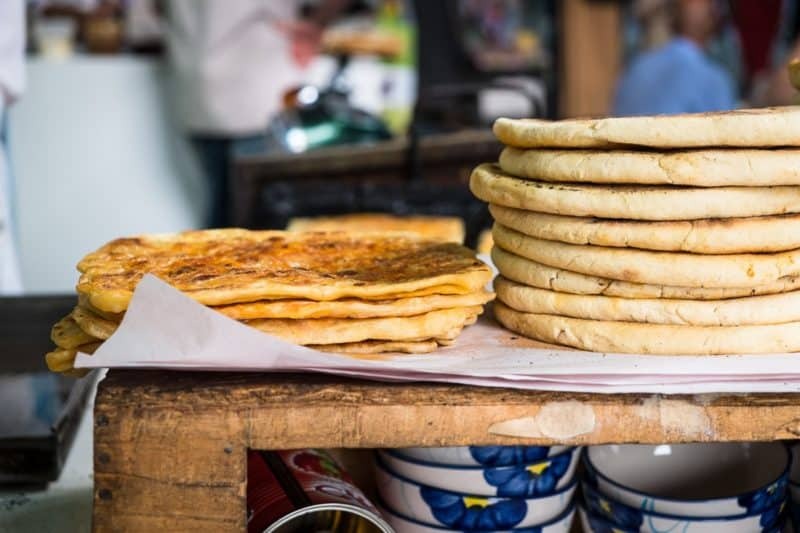 flatbread-like pancakes with honey and smen (fermented butter), spices, or dipped in amlou. Tangia. A Marrakechi special of lamb and preserved lemon slow-cooked overnight in the furnaces that heat the hammams. 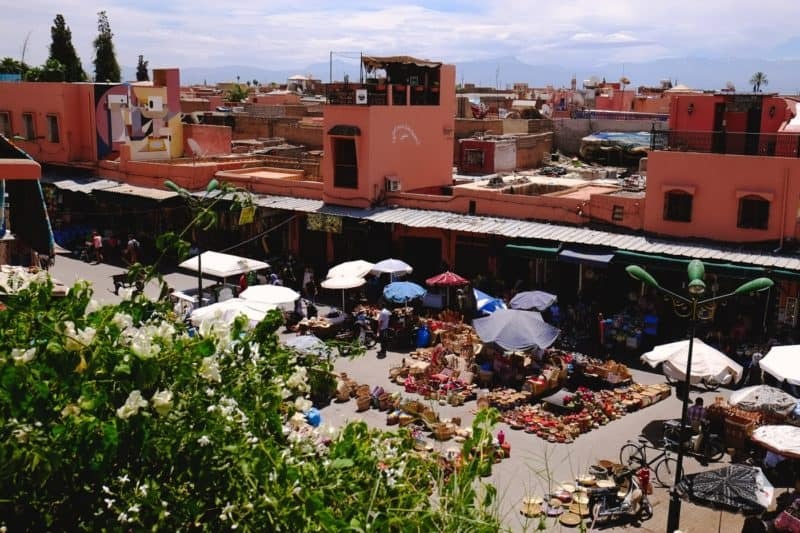 The markets of Marrakech Medina need little introduction and are arguably the city’s main draw. The famous (and UNESCO-protected) Djemaa el Fna square at its centre is the cultural heart of the city. The square comes alive at night with storytellers, musicians, snake-charmers, and food vendors. My favourite corner is the mint market, dispensing huge bundles of the stuff for use in mint tea and perfuming the air with its cool fragrance. Although imperceptible upon arrival, the medina is divided into smaller community areas, each with a mosque, hammam, and a local market for fruit and vegetables. Specialist sellers are also clustered into souks (markets) throughout the medina—the spice market is one example (and one of the easiest to find). Chips in a tagine – it works. 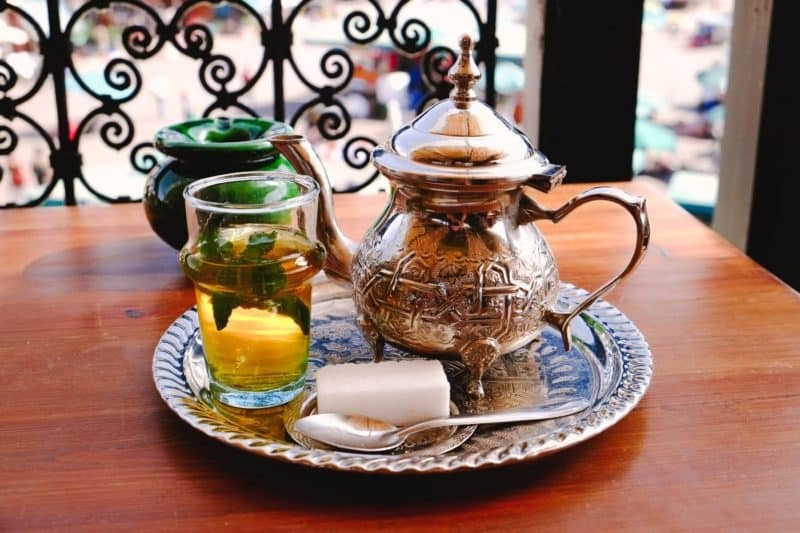 Marrakech is one of the best and cheapest destinations to take a cookery class. Virtually every riad or hotel will offer this, either in-house or at a larger school. 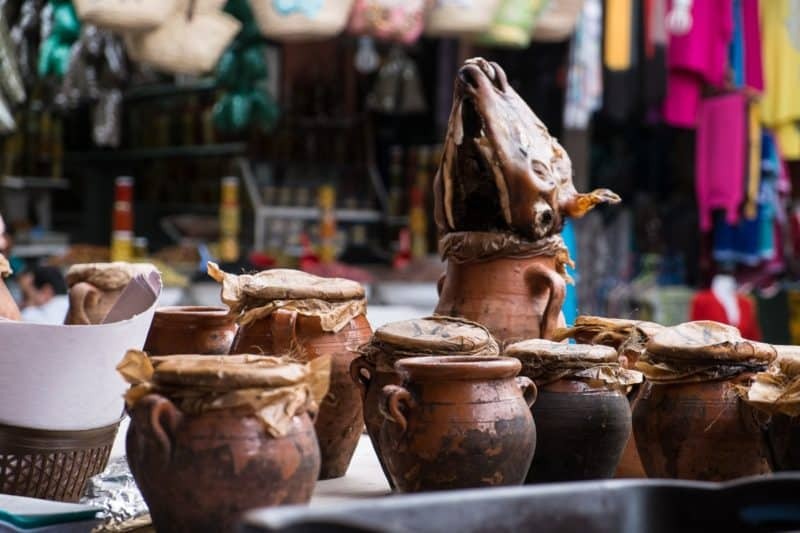 Classes do vary in terms of what they include; cheaper classes might involve helping your chef with a tagine, whilst more expensive classes might include learning multiple dishes and shopping at the market for ingredients. For foodies with a sweet tooth, Amal can also organise a baking class. 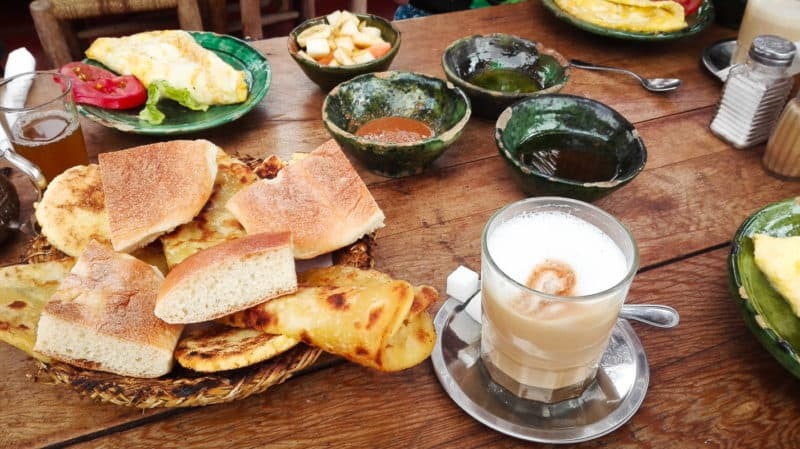 Without a doubt, if you’re into trying local foods then you should check out the Marrakech Food Tours run by Amanda of Maroc Mama. If only every food tour was this good. The evening tour takes in a number of stops around the medina. A sandwich-based tour and gourmet riad tour are also available. 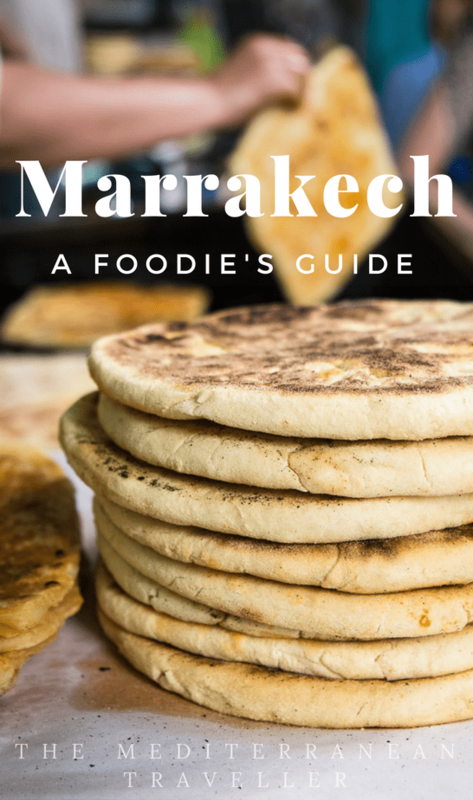 Check out my review of Marrakech Food Tours. Argan oil. Morocco is the main producer of argan oil, which is used in cooking and cosmetics. It’s made from the kernels of argan nuts which grow on trees near Essaouira to the south of Marrakech. Prices are high as the shelling of the nut is done by hand, often by Berber women, and it’s an increasingly popular ingredient in cosmetics. If the price seems cheap it’s probably diluted. Cosmetic grade oil is light and mild, culinary oil tends to be darker as the nuts have been toasted before extracting the oil. Look for oil stored in dark glass packaging. It has a medium smoke point but is mainly used for dressings and dipping. There are a number of co-operatives in Morocco that you can visit to buy from source. Spices. The most popular spice mix in Marrakech is ras el hanout. Meaning ‘top of the shop’, every store has its own version of the mix which can contain more than 20 different spices. You can also pick up mixes to use for recreating your favourite tagine at home, as well as shop for individual spices such as cumin and cinnamon. But while those appealing mounds of spices make for great photos, spices degrade in contact with air so look for shops which store spices in jars. Watch out for fake saffron too; this expensive spice is often swapped out for fabric strands dyed orange. Tagine. You’ll see plenty of decorated ceramics for sale in the souks, but these painted and glazed beauties are often unsuitable for cooking due to the presence of lead in the glaze (no matter what the seller tells you). Tagines for cooking are usually (although not always) unglazed. It’s difficult to know for sure without a lead-testing kit, so to be on the safe side buy ceramics for decorative use only. I would have bought this gorgeous hardback just for the cover (I’m a sucker for blue geometric patterns). Thankfully it has some ace recipes too. It’s a vibrant, modern take on Moroccan flavours with recipes likes aubergines and tomatoes with crispy halloumi, and stir-fried prawns with preserved lemons. Check the latest reviews and prices on Amazon. This volume is slimmer but packed with a perfect selection of the classics that you’ll want to recreate when you’re home from your trip. Plenty of flavourful tagines, pastries and salads that would make an excellent dinner party for your friends.